Sight unseen was a gamble but I was thrilled when I unrolled mine. The colors are a bit more muted than the pics but that was perfect for my neutral colors. I wanted something understated but interesting. The quality is good, thickness acceptable and edging is sewn well. One corner tends to curl up some but that & shipping kinks are settling down fine. It does slide on carpet and wood so need a pad underneath or anchor w furniture legs - or adjust every few days. Many compliments on this rug. I LOVE it! 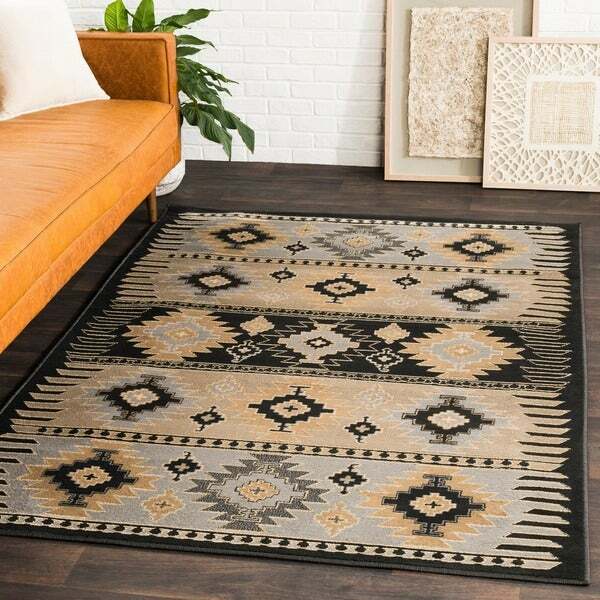 Mithra Black Southwestern Area Rug - 5'3" x 7'6"
The Curated Nomad Zanjero Black/ Tan Southwestern Aztec Area Rug - 5'3" x 7'6"
Made from polypropylene for durability and softness, this charming Mike rug from Copper Grove will add casual style to your home. The attractive, machine-woven rug features a southwest pattern, rendered in ivory, safari tan, charcoal grey, and light grey colors. This rectangular rug is latex free for allergy sensitive individuals, making it a trendy and practical choice for your living room. Option: black - 5'3" x 7'6"
First things first this rug is not woven as the description says however if you have brains you could tell that from looking at the pictures, and reading the pile height. It's very low pile but still soft and comfy. I live in an apartment which has high pile carpet throughout and this doesn't give off the to much rug/carpet vibe. The colors are accurate from the pictures. The charcoal color is beautiful. Like any rug it needs time to flatten out. I rolled the rug in the opposite direction and left it for about an hour, that really helped flatten it out. I've been wanting a southwestern style rug for a long time but they are pricey so I was sold as soon as I found this one. At this price it's a steal. I would recommend this. Option: black - 7'9" x 11'2"
Thin rug but very soft on feet, no squish or bounce. Love the color and the Navajo style. Large area rug that covers my entire living room space. Some slip. I have it anchored by furniture and that works great. This rug was exactly what I was looking for. It has a great style, without the heavy price tag. It looks just as good in person as it does in the pictures. However, I would say that the grey is a bit darker in real life. It is really more of a charcoal, than a grey. The rug is classy and neutral without being boring. It is a great dirt concealing color and the texture is soft and feels like high-quality. Great find! Negative sides: this rug is very thin and has colors that do not match those on the image presented above so it gives a general impression of light blue (the most abundant color is in fact not ivory as is stated but light blue). Positive sides: it has an interesting design and and, due to its light palette of colors, it brightens the areas with dim light. It may be a perfect choice for dog owners due to its affordable price and easy cleaning. This rug is absolutely beautiful, lays flat and is very soft on your feet. I am so pleased with this purchase. I was pleasantly surprised that for a rug that was so inexpensive I got exactly what I was expecting. While not great quality it works. I have 5 cats so buying an expensive rug is out of the question for obvious reasons. The pile is very flat and tight so it would be really hard for them to scratch it up. The color seems a bit more muted than the picture, but perfect match to my room. The only criticism is that it was wound so tight that after 3 days on the floor, it is still not laying completely flat but it is getting better so I think it will flatten out well. Absolutely love it! Did have some trouble getting the corners to unroll. Tip: unroll as soon as you get it and roll it up the other way for a couple hours. The lighter grey color was more blue, but it worked perfect with the rest of my decor! I've now had this rug in my living room for about 2 years and its still beautiful. I have turned it to where the corners under my couches were out in the open so one side didn't wear quicker than the other. It has held up well to a lot of foot traffic (we have a lot of family over quite often - every holiday and family event is at my house) and pets (I have three fur babies that aren't exactly gentle when playing on the rug). The blueish color that the picture shows as grey - mentioned above - does turn more to a dusty blue/grey after a while. It has held up great to vacuuming and shampooing. It is not very thick, so if you're looking for padding a thicker rug pad under it is recommended, but that is the only bad thing I could say about this rug. So..going on 3 years with the rug and the backing has completely given out. I have deducted one star because of that. Everything that you would normally vacuum off the top of the rug has gone through it and is now underneath. I have to move my couches off and pull the rug out now (which is not easy with two reclining couches and an 8x11 rug). The colors are fading at this point. It was good for the price but I will not be buying a synthetic rug again. I absolutely love this rug! Looks exactly as it does in the picture. Very southwestern and stylish. I believe i got a tremendous bargain. The pile is low but the design is beautiful. Looks great in my room with my sand colored tile floor and black leather furniture. HAPPY! Love this rug for the value of a huge rug! It is thick enough to be comfortable under your feet and the colors went great with my grey walls and turquoise accents! So far, so good. Very nice. I found the complaints about the curling edges to be exaggerated. After a couple of days with some weight on them, they are just fine. The light grey color has a blue tinge to me, like a grey-blue or blue-grey. Option: black - 2' X 3' | black - 5'3" x 7'6"
The design is as shown but can't get the rug to lay flat. I made five differnet purchases within the past month or so to add some flair to my decor. All of the others rated excellent on my list but this one fell short. I have it on top of carpet and it does not lay flat. It is really stiff and the corners curl so we are constantly tripping on it. Also there was a flaw in the pattern. The charcoal color is more black than charcoal. I would have returned it but for the price it wasn't worth the effort to return. Maybe it would lay better on a hardwood floor???? Option: black - 8'10" x 12'9"
O his rug is from Egypt it is a piece of art. I am glad to have this displayed in my home. The charm of brings to this family room is priceless. Great design and color. This rug matches the colors presented exactly. The rug us very thin and not the best quality. You pay for what you get. It will work great for what I purchased it for. Option: black - 2' X 3' | black - 8'10" x 12'9"
I would recommend a smaller size....the larger you get the more spread out the print is....leaving mostly tan showing. I purchased this rug for my mother and she loves it . Great piece for her sunroom . The piece was great! Nicely made. Looks as pictured. Option: black - 5'3" x 7'6" | black - 6'7" x 9'6"
Lovely design, but I could not keep it from sliding and bunching, It was basically unsafe from tripping over it! I had a rug pad plus used a silicone addition to all corners. It has a synthetic machine woven backing. I have found that a natural fiber backing with hand loomed rugs to be amazing. No pad needed! Option: beige - 8'10" x 12'9"
This rug is by far my most favorite piece from any purchase made from overstock! Looks exactly like the picture and the quality is by far the best! Option: beige - 6'7" x 9'6"
So excited about this rug! Such an amazing price for such a great quality rug. Option: beige - 5'3" x 7'6"
This is a nice rug for the price. I really like the pattern and the color combination. I would definitely recommend it to all my friends, and I would buy it again. Option: beige - 7'9" x 11'2"
Rug appears a bit darker than what is in the picture but it is absolutely gorgeous. It is the centerpiece of the room and the color combination allows for many different color pieces around it. "I need the 5 x 7 and the runner in beige; however, the runner shows "camel" in lieu of beige. It appears lighter. Do you have the runner in beige??" "I want to make sure I buy the correct color. I want the rug with a black border. Is that the "Black - beige/gray" option?" Yes, the beige/gray (darker) option you'll want to select. Please keep in mind that is a dark gray (almost black) color. "what is the weight of this rug? as I want to mount on a wall." This item weighs approximately 12 lbs. "Is the trim brown or black?" "Is this rug a loom (loop rug) or is it a pile?" "Will this rug size in the wheat color be restocked?" It should be back in stock next spring. "Just ordered the rug... where can I find the ottoman?? I love it." I searched for that ottoman too! No luck. Hope someone can find it. Did anyone find the ottoman?